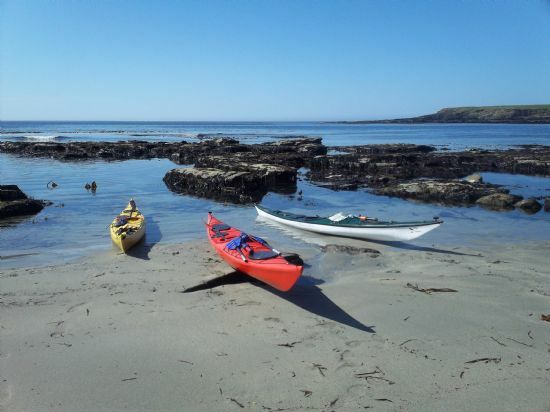 Based on the beautiful Orkney Islands our main discipline is of course sea kayaking. From May to September we meet up on Tuesday and Thursday evenings and launch our sea kayaks. Juniors and beginners meet up each Tuesday 7 pm at Scapa Pier. New beginners very welcome. Most of what you need will be provided but bring a synthetic top (not cotton! ), a warm hat and shoes you don't mind getting wet. More experienced paddlers meet up each Thursday 6:30 pm at Orkney Sailing Club's yard at Hatston Slip, Kirkwall. Again the club can provide kayak, paddle, buoyance aid, wetsuit etc. Less experienced paddlers are better starting off in the Tuesday sessions until they find their feet. During the winter months if the weather is reasonable we sometimes arrange ad hoc paddles, details of which are circulated by text, email or on this site. On weekends throughout the year we occasionally go on longer trips sometimes involving overnight camping from our kayaks. Orkney is an archipelago of over seventy islands and skerries, seventeen of which are inhabited. The surrounding seas are rather exposed and there can be strong tides, standing waves, swell and wind so planning is essential. However, with so many islands there is generally sheltered water somewhere and with knowledge and prior planning a paddle suitable for the experience and skill level of the paddlers taking part can nearly always be found, whatever the conditions. 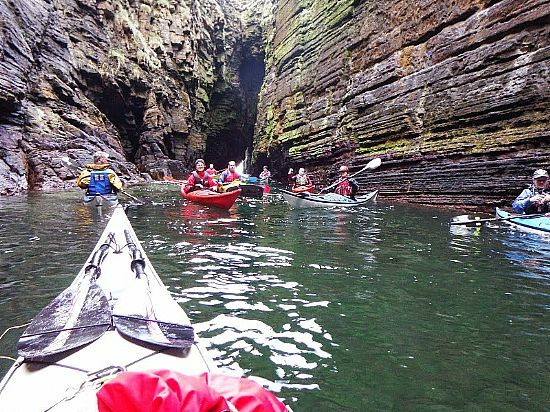 Orkney's cliffs are predominantly soft sandstone and erosion from wind and sea has carved some spectacular rock formation and amazing caves for the kayaker to explore. These cliffs come alive with birds, especially at breeding time in the spring. The paddler will also get up close to seals, whales, sharks, dolphins, porpoises and maybe even an otter. Stranded Marine Animal Poster .